This book offers a modular set of chapters that focus specifically on the challenges related to case writing. Exercises, worksheets, and training activities help guide readers sequentially through the entire process of writing both a case and an instructor’s manual (teaching note). Finishing all the book’s assignments will result in a complete case and instructor’s manual that can be tested in the classroom and submitted to a conference or journal. The Case Writing Workbook is a must for the shelf of any academic or student conducting qualitative research and looking to enhance their skill set. 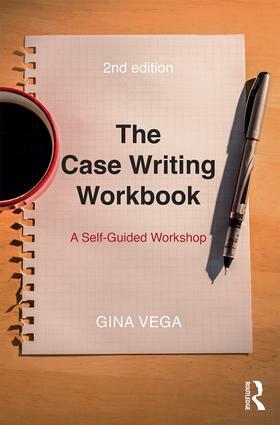 "Gina Vega’s The Case Writing Workbook is a generous book written to support academics in researching and writing robust, fact-based cases that engage students and accelerate learning. The new edition continues to share a ‘how to’ practice-based approach to case writing with useful tips, worksheets, and examples. The new modules are valuable additions to this comprehensive guide. Readers from novice to experienced will feel Gina Vega’s presence as they read and progress through the workbook; her support and encouragement are present throughout." "This user-friendly, step-by-step guide for faculty new to case research, writing, and publishing is also a handy refresher for experienced writers. It’s chock-full of practical advice and insider tips as well as helpful new modules on compact cases and transforming published research into cases. It also has weekly guides for case writing during heavy teaching semesters or sabbaticals. We distributed it at a workshop to help faculty succeed with case writing and publishing." "As a case publisher and instructor, I welcome the new edition of Vega's book on the art of authoring and teaching with cases. Instructors, authors, and researchers will find everything they need to know about cases in this comprehensive and accessible new edition." Gina Vega is founder and president of Organizational Ergonomics, USA. Check out these slides from Gina’s recent book launch in Lima, Peru! And watch this space for the full video presentation.